We strategically place the engraving on the thickest cross section of the 17-4 stainless steel mount for fast and easy replacement should the suppressor become damaged beyond repair it also serves to make the Obsidian 45 infinitely upgradable in the future. A common problem with pistol caliber suppressors is the gas blowback associated with slotted pistons. The Obsidian45’s non-slotted piston system solves this issue by creating a full circumference gas seal. The Obsidian45 comes standard with the suppressor, ADAPT Module, 45 Front Cap, .578×28 Piston (fits most standard .45 Auto threaded barrels), Operator’s Manual, and Obsidian Logo Sticker. 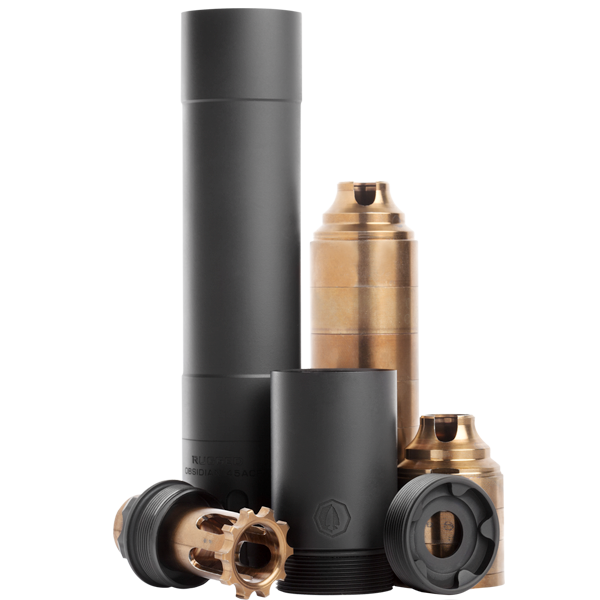 Additional accessories such as fixed barrel mounts, pistons for use with other calibers/thread pitches, and 9mm Front Cap are available for purchase separately.